one cup (8 oz) of warm distilled or bottled water. A stronger mixture is not better! Saline solution that is too strong can irritate the piercing. 1) WASH your hands thoroughly prior to cleaning, or touching on or near your piercing for any reason while healing body piercings. 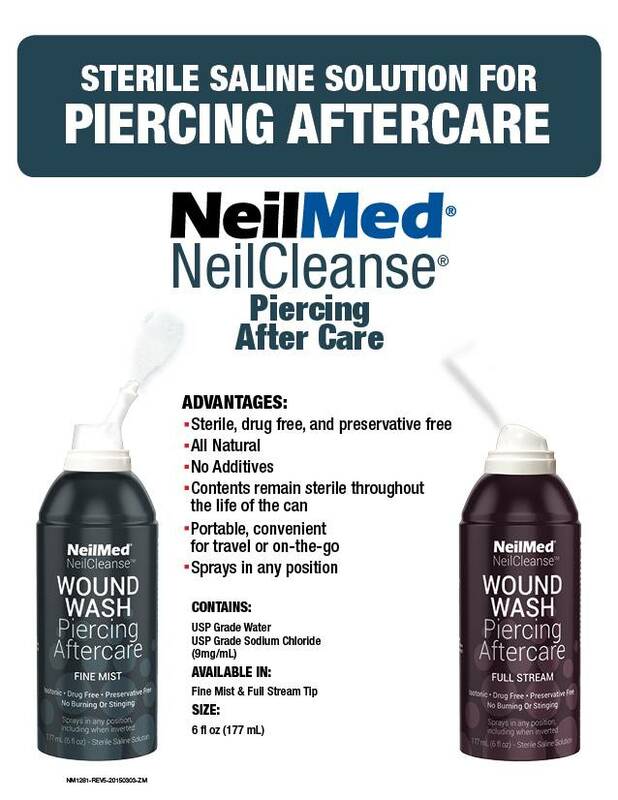 2) SALINE soak or spray NeilMed NeilCleanse Piercing After Care at least two to three times daily. 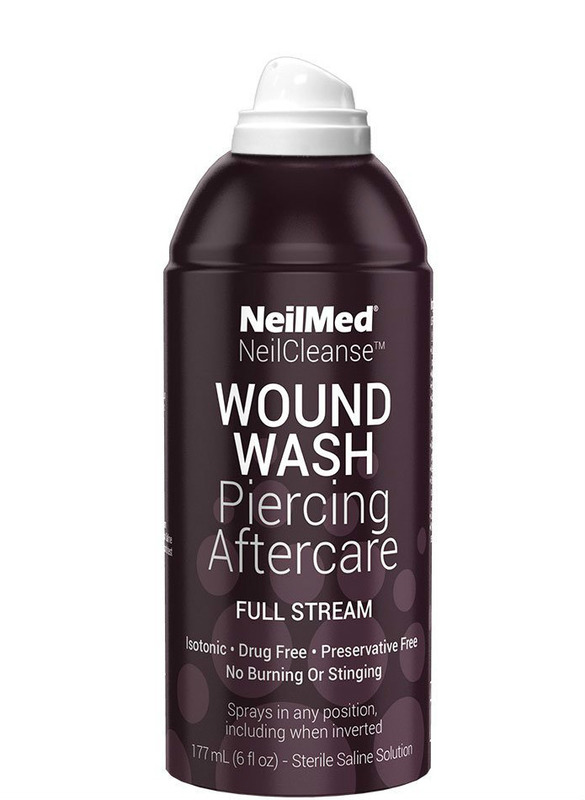 Simply invert a cup of warm saline solution over, the area to form a vacuum for a few minutes or use your NeilCleanse body piercing aftercare products. The longer you soak, the better. For certain placements, it may be easier to apply using fresh gauze or a cotton ball saturated with saline solution or use spray bottle. A brief rinse will remove any residue. 3) SOAP no more than once or twice a day. While showering, lather up a pearl size drop of the soap to clean the jewelry and the piercing. Leave the cleanser on the piercing no more than thirty seconds, and then rinse thoroughly to remove all traces of the soap from the piercing. 4) DRY with disposable paper products such as gauze or tissues, because cloth towels can harbor bacteria and catch on new piercings causing injury. Pat gently to avoid trauma. – Initially: some bleeding, localized swelling, tenderness, or bruising. – During healing: some discoloration, itching, secretion of a whitish-yellow fluid that will form some crust on the jewelry. The tissue may tighten around the jewelry as it heals. – Once healed: the jewelry may not move freely in the piercing; DO NOT force it. If you fail to include cleaning your piercing as a part of your daily hygiene routine, normal but smelly bodily secretions may accumulate. – A piercing may seem healed before healing is complete this is because piercings heal from the outside in, and although it feels healed the tissue remains fragile on the inside. BE PATIENT, and keep cleaning throughout the entire healing period. – Even healed piercings can shrink or close in minutes after having been there for years, and this varies from person to person; if you like your piercing, leave the jewelry in place. Rinse mouth 4-5 times daily with cleaning solution for 30-60 seconds after meals and at bedtime during the entire healing period. If you are over clean, it may cause discoloration or irritation of tongue. 1) WASH your hands thoroughly prior to cleaning, or touching on or near your piercing for any reason. 3) SOAP no more than once or twice a day when healing body piercings While showering, lather up a pearl size drop of the soap to clean the jewelry and the piercing. Leave the cleanser on the piercing no more than thirty seconds, and then rinse thoroughly to remove all traces of the soap from the piercing. We only use the highest quality body jewelry so why wouldn’t we use the best healing products available? We sell what we use!